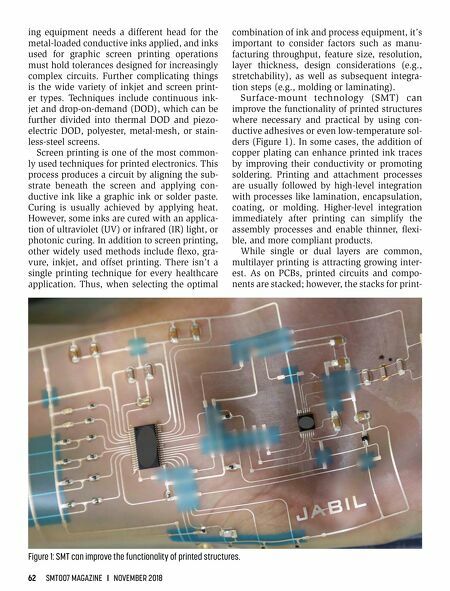 62 SMT007 MAGAZINE I NOVEMBER 2018 ing equipment needs a different head for the metal-loaded conductive inks applied, and inks used for graphic screen printing operations must hold tolerances designed for increasingly complex circuits. Further complicating things is the wide variety of inkjet and screen print- er types. Techniques include continuous ink- jet and drop-on-demand (DOD), which can be further divided into thermal DOD and piezo- electric DOD, polyester, metal-mesh, or stain- less-steel screens. Screen printing is one of the most common- ly used techniques for printed electronics. This process produces a circuit by aligning the sub- strate beneath the screen and applying con- ductive ink like a graphic ink or solder paste. Curing is usually achieved by applying heat. However, some inks are cured with an applica- tion of ultraviolet (UV) or infrared (IR) light, or photonic curing. In addition to screen printing, other widely used methods include flexo, gra- vure, inkjet, and offset printing. There isn't a single printing technique for every healthcare application. Thus, when selecting the optimal combination of ink and process equipment, it's important to consider factors such as manu- facturing throughput, feature size, resolution, layer thickness, design considerations (e.g., stretchability), as well as subsequent integra- tion steps (e.g., molding or laminating). 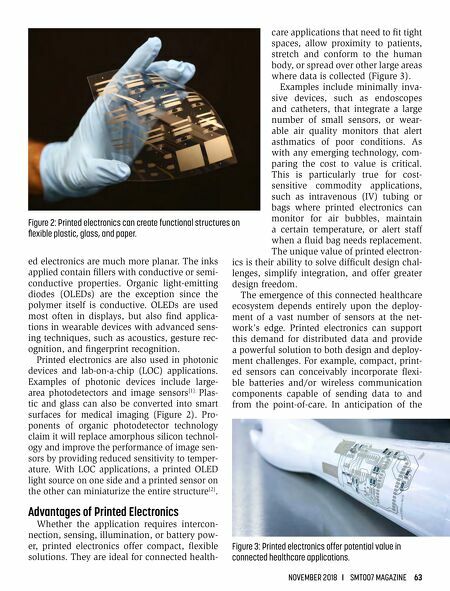 Surface-mount technology (SMT) can improve the functionality of printed structures where necessary and practical by using con- ductive adhesives or even low-temperature sol- ders (Figure 1). In some cases, the addition of copper plating can enhance printed ink traces by improving their conductivity or promoting soldering. Printing and attachment processes are usually followed by high-level integration with processes like lamination, encapsulation, coating, or molding. Higher-level integration immediately after printing can simplify the assembly processes and enable thinner, flexi- ble, and more compliant products. While single or dual layers are common, multilayer printing is attracting growing inter- est. As on PCBs, printed circuits and compo- nents are stacked; however, the stacks for print- Figure 1: SMT can improve the functionality of printed structures. Column — Is This a Golden Age for Medical Devices? Column — SMT Manufacturing: Why Soldering? Feature Column — Does Medical Device Reliability Worry You Sick?